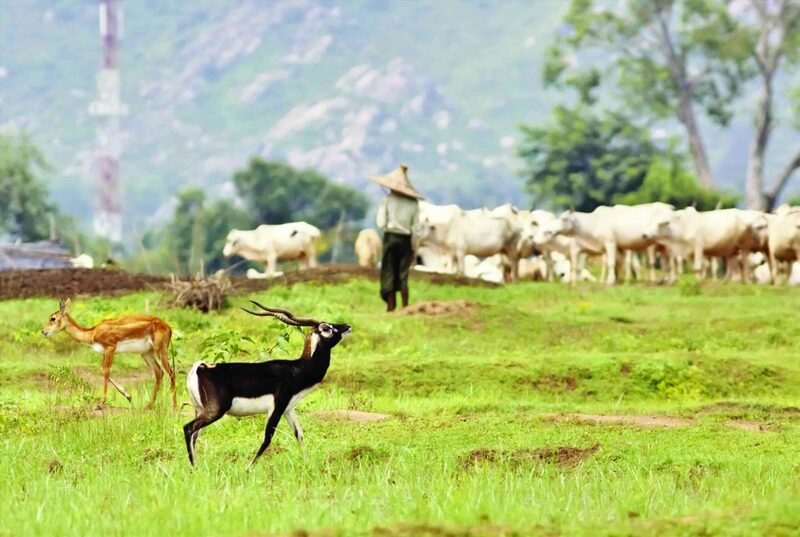 A small nondescript village in the hearts of Ganjam district of Odisha is home to numerous herds of Blackbuck, and their protectors, the lion-hearted native villagers of Bhetnoi. “Chaliye Sir, ab woh mast mood me milenge,” (Come along Sir, we’ll get them in good mood now) was the nudge which came from my guide, Madhu Behera. He was referring to the day-long trip we had planned to Bhetnoi to observe Blackbucks during the mating season in their natural habitat. Visiting the Balipadar- Bhetnoi range had been at the back of mind, ever since my birding trip to Mangalajodi, Odisha last winter. What had intrigued me further was witnessing how human faith in the supernatural could manifest into an act of conservation. This time, it was the middle of the monsoons of 2014, and the heavy precipitation in Mangalajodi had left me cooped up in my cottage. When a morning without rain presented itself, I consented to Madhu’s idea of visiting the Blackbucks at Bhetnoi. We started early from Mangalajodi in a Maruti Omni, driven by Ramesh – an energetic driver and a keen observer of nature, who was hand-picked by Madhu himself. As we hit NH16, Ramesh stepped on the accelerator; the heaping black clouds loomed ominously over the northeastern horizon and we had a long way to go. The plan was to make maximum use of this weather-window, before the torrent set in again. The nearly 60km drive along the Chilka Lake ended as we turned sharply at Khallikot, onto SH30. Another 70km drive through small towns brought us to Charmoi Chhak (crossing); Bhetnoi was just a kilometre away now. Suddenly, Ramesh screeched to a halt, reversed and then slowly pulled up to a spot of his liking. “Occhi (there)!” he nodded to Madhur, who had already spotted the herd by then. There were about ten of them, all adult males, looking tentative about crossing the road, and loitering 50 metres away from us. I trained the barrel of my 300mm lens on the herd and clicked away merrily despite the intervening thickets until a distant thunder reminded me that more ground was to be covered before the storm reached us. This was just the beginning of my memorable engagement with arguably the most beautiful of all antelopes. From here on, we were assisted by a local fellow Sushant, who not only knew about the behavioural pattern of the Blackbucks but also understood my photographic requirements. He led us around a vast and verdant grassland, stretching from one line of distant hills to another so that we could observe the Blackbucks under favourable light conditions for photography. The adult Blackbuck males I saw had a striking black-and-white pelage and long, spiral horns. These horns seldom exceed 50cm in length. Younger males are lighter, dark brown to duller black in colour, and get the black tones only by the age of 3 years. Females are beige in colour and hornless. These are social animals and prefer to live on open grasslands. The largest groups in Bhetnoi, about 15 members strong, consisted only of females, while bachelor male groups usually had 8-10 members. The average group size, 10-15, was observed with mixed herds. As I happened to visit during the mating season, the most handsome males had established territories over the prime grazing areas. Unfortunately, though, I found it increasingly difficult to photograph the Blackbucks as we progressed. Eventually, it struck me that I need to get my photography gear to the safety and we started to head for cover. This finally brought an end to our intense, five-hour-long photography session with the elegant Blackbucks, but it was hardly the end of my story. As recounted by Ramesh, the Bhetnoi area is majorly inhabited by farmers and shepherds of the Kalonji community of Odisha. 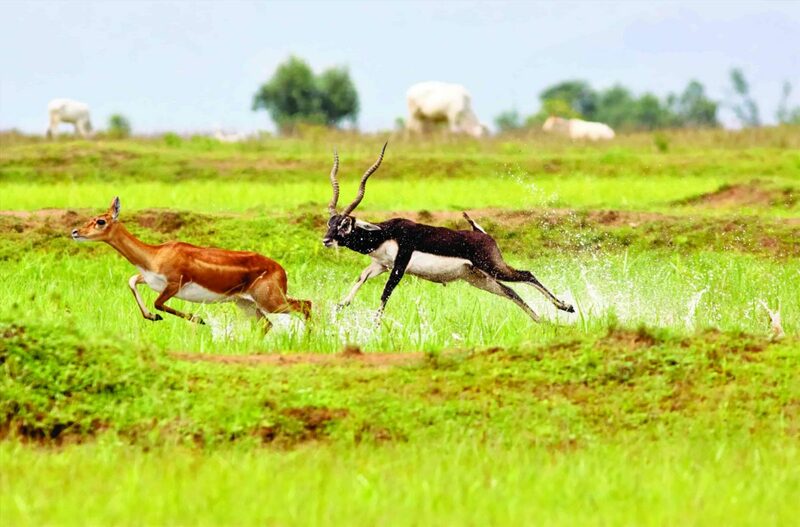 The antelopes are known by several names here, ‘Bali Harina’, ‘Krushnasara Mruga’and ‘Kala Bahutia’ being some of them. Bhetnoi and the surrounding areas have become famous because of the organised co-habitation and protection initiatives practised by the local people here. Reminiscent of the Bishnois of Rajasthan, the presence of a Blackbuck Protection Committee in the village speaks leaps and bounds of the commitment of the locals towards the cause. Surprisingly, the reason behind this special interest in the Blackbucks is a story deeply linked with religious faith. As legend has it, more than a century ago, there was a long spell of drought in this area. While people were reeling under the scourge of famine, a small herd of Blackbucks appeared in the vicinity. The rains soon followed and brought an end to the crisis. 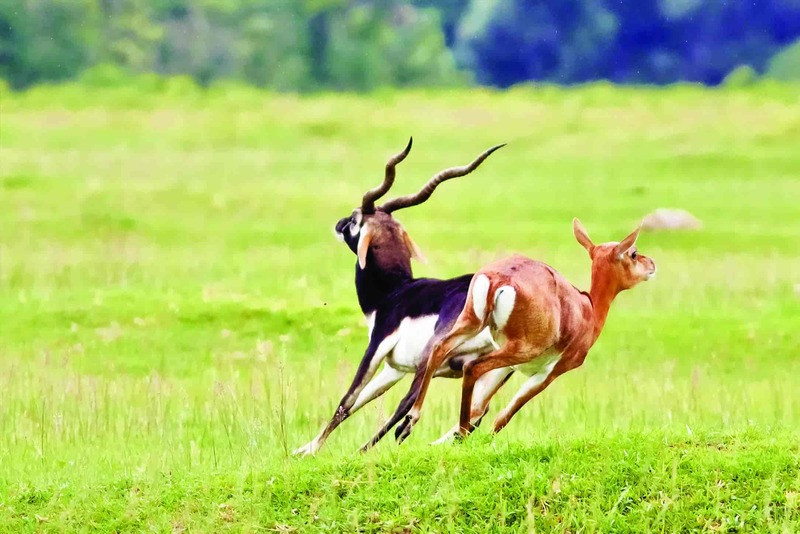 Since then, people here have religiously protected the Blackbucks, asserting them as the harbinger of prosperity. In 1918, an Englishman, known as ‘Green Sahib’, along with the leader of a local community took the initiative, and published a notification in an Odiya newspaper, Prajamitra, prohibiting the killing of Blackbucks. The Balipadar-Bhetnoi area lies in the Ganjam District of Odisha and encompasses about 70 villages. The entire habitat comes under three separate forest ranges (Buguda, Aska and Khallikote). The state highway from Khurda to Berhampur via Nayagarh also passes through this habitat. Approximately 60% of this area is covered by cultivated land, 15% is rocky elevations, 10% is human-impacted (houses and roads), 8% under forest cover, 5% water bodies and 2% horticulture farms and wastelands. The Blackbuck census carried out periodically here has revealed a steady increase in the population over the last 15 years or so. Trains can be taken from Kolkata, Bhubaneswar or Puri to Khallikhot Road station. From the station to Khallikhot is about 80km and then Bhetnoi is about 70km from there. Taxis are available. Aska, 63km from Khallikhot and 7km to Bhetnoi, has options for stay. This article would be incomplete without mentioning the Bishnoi tribe. The religion of the Bishnois of Rajasthan is probably the only one in the world that is founded solely on the principle of conserving nature. For the Bishnois, the trees are sacred, but this empathy extends to every living thing on the earth. So they protect the entire ecosystem that exists in and around their villages. No wonder that animals like Blackbucks and Chinkaras, and birds like vultures, partridges, peafowls and even the endangered Great Indian Bustard find sanctuary in a Bishnoi village. Not only do the Bishnois protect them from poachers, but they also actively participate in helping them lead a life of plenty. Herbivores graze freely in their farmlands and stone vessels and hanging pots filled with water, quench the thirst of many during the harsh summers. Bishnoi women are even known to breastfeed abandoned antelope calves! A major change that’s happened in the age-old approach of the Bishnois is their shift from passive conservation to active conservation. Today, they actively pursue armed poachers with bare courage, capture them and hand them over to the forest authorities. In the last twenty years alone, around 14 Bishnois have laid their lives in defending these animals! Gautam Bhattacharya is a nature enthusiast, who explores his surroundings with a sight for new perspectives. Being influenced by the people across the world that are avowed crusaders in their efforts to preserve the pristine nature and ably supported by his family in his quest, Gautam has embarked in his journey toward sustaining the environment and documenting its glories in different good-practices of cohabitation. Professionally, Gautam is presently on the faculty in an organisation of the Government of West Bengal, India.